3. Occam's razor: ITILA Figure 28.3. Why Bayesian inference embodies Occam’s razor. 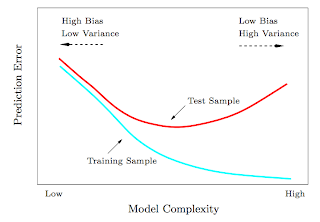 This figure gives the basic intuition for why complex models can turn out to be less probable. The horizontal axis represents the space of possible data sets D. Bayes’ theorem rewards models in proportion to how much they predicted the data that occurred. These predictions are quantified by a normalized probability distribution on D. This probability of the data given model Hi, P (D | Hi), is called the evidence for Hi. 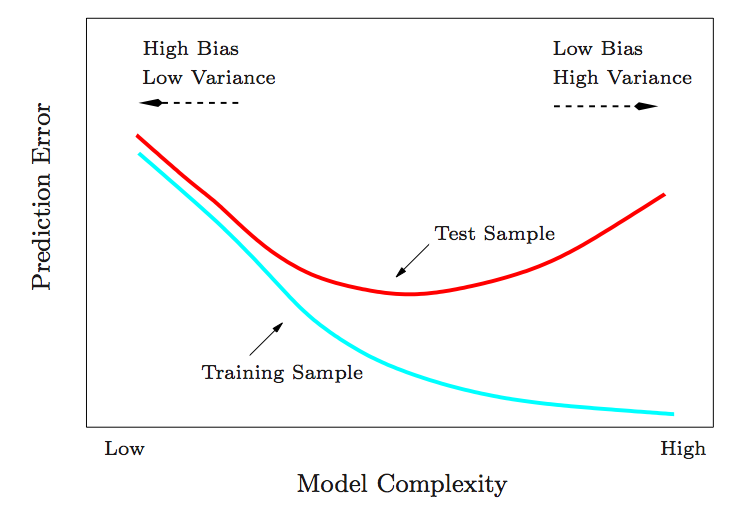 A simple model H1 makes only a limited range of predictions, shown by P(D|H1); a more powerful model H2, that has, for example, more free parameters than H1, is able to predict a greater variety of data sets. This means, however, that H2 does not predict the data sets in region C1 as strongly as H1. Suppose that equal prior probabilities have been assigned to the two models. Then, if the data set falls in region C1, the less powerful model H1 will be the more probable model. 4. Feature combinations: (1) Why collectively relevant features may look individually irrelevant, and also (2) Why linear methods may fail. From Isabelle Guyon's feature extraction slides. 5. Irrelevant features: Why irrelevant features hurt kNN, clustering, and other similarity based methods. 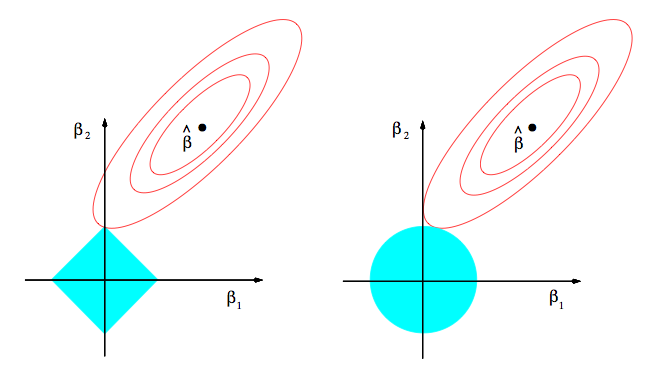 The figure on the left shows two classes well separated on the vertical axis. The figure on the right adds an irrelevant horizontal axis which destroys the grouping and makes many points nearest neighbors of the opposite class. 6. 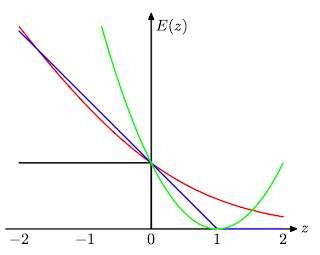 Basis functions: How non-linear basis functions turn a low dimensional classification problem without a linear boundary into a high dimensional problem with a linear boundary. From SVM tutorial slides by Andrew Moore: a one dimensional non-linear classification problem with input x is turned into a 2-D problem z=(x, x^2) that is linearly separable. 7. Discriminative vs. Generative: Why discriminative learning may be easier than generative: PRML Figure 1.27. 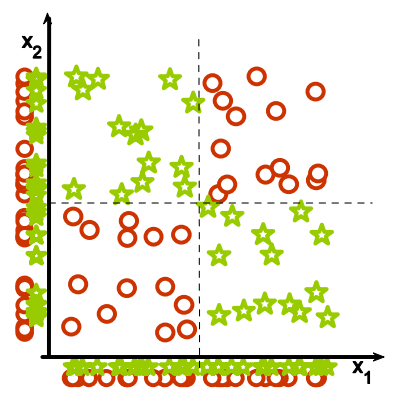 Example of the class-conditional densities for two classes having a single input variable x (left plot) together with the corresponding posterior probabilities (right plot). 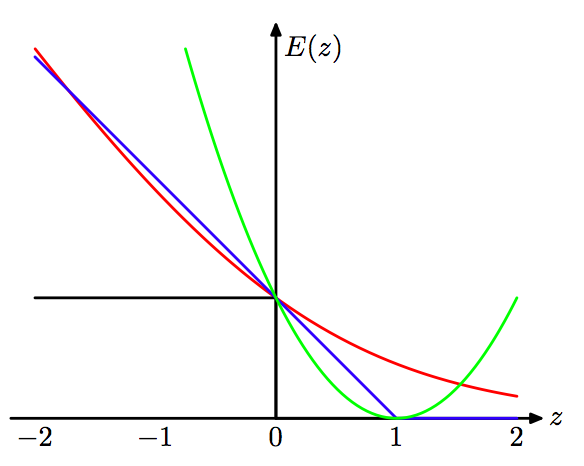 Note that the left-hand mode of the class-conditional density p(x|C1), shown in blue on the left plot, has no effect on the posterior probabilities. The vertical green line in the right plot shows the decision boundary in x that gives the minimum misclassification rate. 8. Loss functions: Learning algorithms can be viewed as optimizing different loss functions: PRML Figure 7.5. 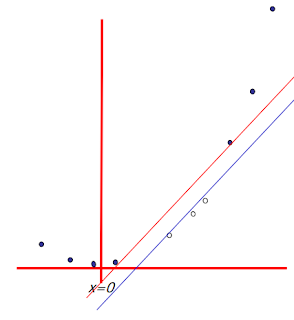 Plot of the ‘hinge’ error function used in support vector machines, shown in blue, along with the error function for logistic regression, rescaled by a factor of 1/ln(2) so that it passes through the point (0, 1), shown in red. Also shown are the misclassification error in black and the squared error in green. 9. 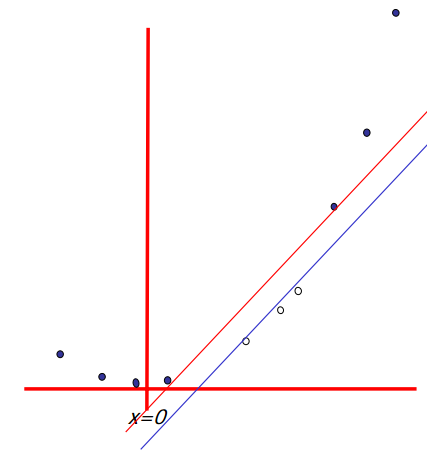 Geometry of least squares: ESL Figure 3.2. The N-dimensional geometry of least squares regression with two predictors. 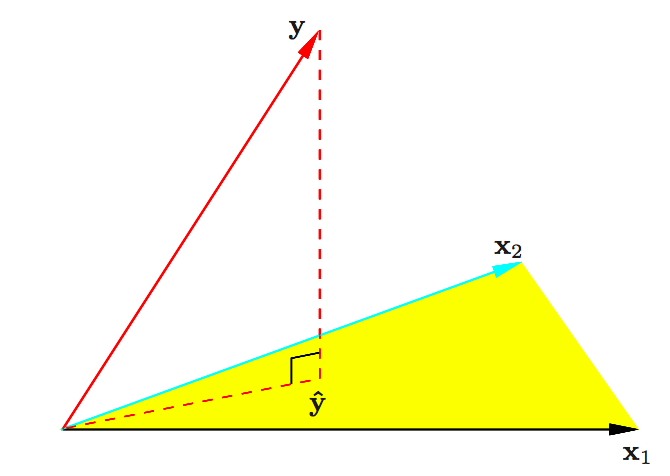 The outcome vector y is orthogonally projected onto the hyperplane spanned by the input vectors x1 and x2. 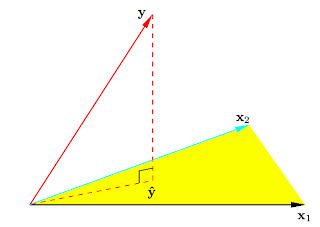 The projection yˆ represents the vector of the least squares predictions. 10. 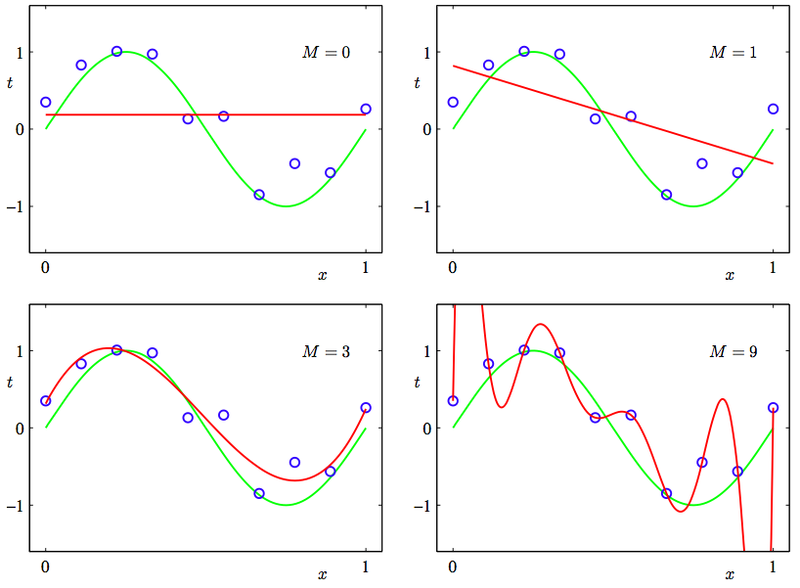 Sparsity: Why Lasso (L1 regularization or Laplacian prior) gives sparse solutions (i.e. weight vectors with more zeros): ESL Figure 3.11. Estimation picture for the lasso (left) and ridge regression (right). 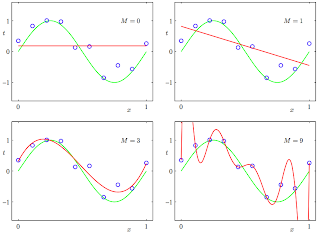 Shown are contours of the error and constraint functions. The solid blue areas are the constraint regions |β1| + |β2| ≤ t and β12 + β22 ≤ t2, respectively, while the red ellipses are the contours of the least squares error function. Current position: Software Engineer, Facebook. (Linkedin, Publications). M.S. Thesis: Stretch: A Feature Weighting Method for The k Nearest Neighbor Algorithms. 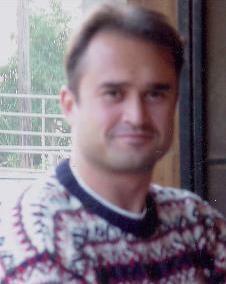 Koç University Department of Computer Engineering, October 2007. (PDF, Presentation). This thesis introduces a new paradigmatic representation of word contexts. Paradigmatic representations of word context are constructed from the potential substitutes of a word, in contrast to syntagmatic representations, which are constructed from the properties of neighboring words. The potential substitutes are calculated by using a statistical language model that is trained on raw text without any annotation or supervision. Thus, each context is represented as a distribution of substitute words. This thesis introduces models with different properties that can incorporate the new paradigmatic representation, and discusses the applications of these models to the tagging task in natural language processing (NLP). In a standard NLP tagging task, the goal is to build a model in which the input is a sequence of observed words, and the output, depending on the level of supervision, is a sequence of cluster-ids or predefined tags. We define 5 different models with different properties and supervision requirements. The first model ignores the identity of the word, and clusters the substitute distributions without requiring supervision at any level. The second model represents the co-occurrences of words with their substitute words, and thus incorporates the word identity and context information at the same time. To construct the co-occurrence representation, this model discretizes the substitute distribution. The third model uses probabilistic voting to estimate the distribution of tags in a given context. Unlike the first and second models, this model requires the availability of a word-tag dictionary which can provide all possible tags of each given word. The fourth model proposes two extensions to the standard HMM-based tagging models in which both the word identity and the dependence between consecutive tags are taken into consideration. The last one introduces a generative probabilistic model, the noisy channel model, for the taggin tasks in which the word-tag frequencies are available. In this model, each context C is modeled as a distinct channel through which the speaker intends to transmit a particular tag T using a possibly ambiguous word W. To reconstruct the intended message (T), the hearer uses the distribution of possible tags in the given context Pr(TjC) and the possible words that can express each tag Pr(WjT). The models are applied and analyzed on NLP tagging tasks with different characteristics. The first two models are tested on unsupervised part-of-speech (POS) induction in which the objective is to cluster syntactically similar words into the same group. The probabilistic voting model is tested on the morphological disambiguation of Turkish, with the objective of disambiguating the correct morphological parse of a word, given the available parses. The HMM-based model is applied to the part-of-speech tagging of English, with the objective of determining the correct POS tag of a word, given the available tags. Finally, the last model is tested on the word-sense disambiguation of English, with the objective of determining the correct sense of a word, given the word-sense frequencies.